Whatever the reason, tax will be a major factor to consider, as will the risks of giving children too much money too soon. It is therefore important for parents and others to appreciate the basic tax and legal rules, and the investment products that are suitable for children to help achieve the goals set for them. You should think about the reasons why you are setting aside money for children, which can have a major bearing on your investment decisions. Timescale is likely to be an important factor in choosing the appropriate investments. As with any investment decisions, risk is another key issue that you need to think about carefully before taking any action. Very broadly, the shorter the timescale, the more you should focus on cash and similar types of investment. If you are looking at five years or more, you should consider investments with a longer-term value, such as shares or property. They involve more risk, but historically provide superior returns over the longer term. The best approach to handling these matters is to consult a competent financial adviser. Children − even babies − are not exempt from tax. If they have enough income or capital gains, they will be subject to a tax bill just like adults. And like adults, they are generally entitled to a certain amount of income without paying tax. This is the personal allowance, and it is £11,850 in the 2018/19 tax year, rising to £12,500 in 2019/20. In addition, each child has a 0% starting rate band covering £5,000 of savings income, a dividend allowance of £2,000 and, assuming they do not pay tax at the higher or additional rate, a personal savings allowance of £1,000. Children also have their own annual capital gains tax (CGT) exempt amount of up to £11,700 of net gains on investments in 2018/19 (£12,000 in 2019/20). There is a special rule that applies to children’s income until the child reaches age 18 or gets married, if earlier. If the child’s income is derived from a gift from a parent it is taxed as the parent’s income, unless the income does not exceed £100 a year (£200 if both parents have contributed jointly). If Mary gives £20,000 to her 14-year-old son Jake and this generates an income of £400 a year, this will be taxed as if it were Mary’s income at her tax rate(s). It could not be set against Jake’s personal tax allowance of £12,500 in 2019/20, so the amount of tax Mary would have to pay would be dependent on her tax position. Fortunately, when a child’s income is derived from non- parental sources it is taxed as the child’s and can be set against their personal allowance. This might include income from investments financed by gifts from grandparents or others, or perhaps earnings from a weekend job or other work. Mary’s father, Graham, is a higher rate taxpayer. If he gives £20,000 to his grandson Jake and it generates an income of £400 a year, this will be taxed as if it were Jake’s income. It would neither be taxable on Graham nor Mary. The income would be set against Jake’s personal tax allowance of £12,500 in 2019/20, so would almost certainly be tax-free for him. Where a child’s income comes from investments funded by grandparents or others, you should identify it carefully to ensure that it does not suffer tax unnecessarily. So, it is a good idea to keep investments provided by parents separate from the money the child has received from other people. Banks, building societies and collective funds, such as unit trusts and open-ended investment companies (OEICs), which pay interest rather than dividends, no longer deduct tax at the basic rate of 20% from interest payments. As a result, non- taxpayers no longer need to register to receive interest gross or go through the process of tax reclaim. Parents can still invest on their child’s behalf without potentially giving themselves a tax liability by using special tax-efficient financial products. It is important for parents and others to appreciate the basic tax and legal rules, and also some of the investment products that are suitable for their children. Several financial products enable parents and others to invest tax efficiently for children. Of course, tax is not the only factor to consider. Aside from investment risk and reward, you need to think about the costs of investing; some investments can be significantly costlier to buy and hold than others. The Junior ISA (JISA) is like the adult ISA. It is a ‘wrapper’ that protects the investments and savings held within it from income tax and CGT. The JISA allows up to £4,260 (£4,368 in 2019/20) to be invested on behalf of a child in cash and/or a wide variety of stock market-based investments. These range from individual shares in companies to UK-authorised unit trusts, OEICs and investment trusts. Children can have one cash JISA and one stocks and shares JISA, but the combined total yearly investment must not exceed the annual maximum. To qualify, children must be under 18, live in the UK and not hold a child trust fund (CTF) account. Children aged 16 or 17 can open their own JISA or take over management and be the registered contact for their existing JISA, but parents or adults with parental responsibility must open and manage these accounts for younger children. Money in a JISA belongs to the child and cannot be withdrawn until they are 18, unless there are exceptional circumstances. Adults can open and manage a Junior ISA for children under 18. At 16 or 17, a child can open their own JISA or ISA, but only the cash component. 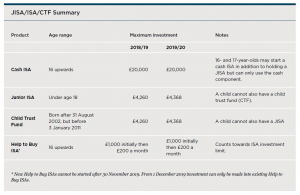 Children aged 16 or 17 can invest in a full ISA, but only in the cash component. The contribution ceiling is £20,000 for full ISAs in 2018/19 and 2019/20, and is in addition to the JISA allowance. The Help to Buy ISA was launched for those aged 16 and over in December 2015. This offers a 25% government tax-free bonus on savings of up to £12,000, provided the proceeds are used to purchase a first home. There is a maximum initial contribution of £1,000 and maximum monthly contributions of £200. The Help to Buy ISA counts as a cash ISA, so generally contributions cannot be made to both in the same tax year. It is possible to transfer the funds in a Help to Buy ISA into a Lifetime ISA (LISA) at age 18. The LISA permits a maximum investment of £4,000 in each tax year (plus up to a £1,000 government bonus) for those aged 18−39. However, a transfer to a LISA will mean losing any potential Help to Buy bonus. These are very similar to JISAs and were available for children born between 1 September 2002 and 2 January 2011. The first CTFs are due to reach maturity in September 2020, prompting the government to announce in the 2018 Budget a consultation on how to maintain their tax advantages after age 18. If a child has a CTF, they cannot have a JISA (and the reverse is also true). Originally, CTFs were set up to hold funds that the government granted to these children, so every child born between those dates has a CTF to which parents and others can contribute up to £4,260 (£4,368 in 2019/20) in total. It is worth checking to see if a child’s CTFs are invested in suitable funds; they can usually be switched if necessary. The tax advantages and rules governing CTFs and JISAs are very similar. The funds are essentially free of UK tax and so are the proceeds on encashment. It is possible for CTFs to be transferred into JISAs, but once the transfer is completed, future contributions can only be made to the JISA. If your child’s JISA allowance has been used up for the tax year and you still want to invest more in stocks and shares on their behalf, you could consider collective funds – i.e. unit trusts, investment trusts or OEICs. Investments in funds for children are usually held in a designated account, which is administered by the parents and belongs to the child, but which they cannot normally access until they are 18. Any income from funds paid for by a parent is treated as the parent’s income under parental settlement rules. Non-reporting offshore funds that allow for income and gains can roll up free of UK tax until the investor disposes of them. At that point, they become subject to income tax in the investor’s hands. Among other uses, this facility can allow parents to invest for a child without the income being subject to tax at parental rates. Then, when the child reaches age 18, the investment can be sold and set against the child’s personal allowance, which would allow them to receive up to £11,850 free of income tax in 2018/19 (£12,500 in 2019/20). If the child has no other income, the £5,000 0% savings rate band and £1,000 savings allowance would then apply before the basic rate at 20% is chargeable. This would mean that, in 2018/19,£17,850 is free of tax with the next £28,500 taxable at 20% (£18,500 and £31,500 respectively in 2019/20). These investments can be used to postpone the potential tax liability until a convenient time for their encashment. Parents or others can invest in these bonds for the child – usually within a trust for the child. The investment bond produces no income for the trust itself and the funds within the bond are subject to tax at the life insurance company’s rates. When the child reaches age 18 or over, the trustees can pass over the bond to the child who can encash it at the rates that apply to them that year. There is little or no UK tax within offshore investment bonds, but the proceeds are potentially subject to starting rate (0%), basic rate (20%), higher rate (40%) and additional rate (45%) tax (note the Scottish income tax rates and thresholds do not apply to savings or dividend income). Gains will also count towards the personal savings allowance. UK investment bonds suffer some tax on the income and gains of the underlying funds, but they benefit from a tax credit for any basic rate tax that would be payable on the bond gains. Investment bonds in trusts are very useful for larger investments for children, but their tax position can be complicated in some circumstances and it is especially wise to seek advice before either making or encashing such investments. Whilst it may seem early, setting up a pension for your child could offer tax-efficient investments and provide security for their later life. The generous tax breaks and long investment term make pensions an effective way to invest for children. Anyone can contribute up to £3,600 gross in a tax year into a personal pension for a child. Contributions automatically benefit from 20% basic rate tax relief, so this means only £2,880 is paid into the scheme and the government will make up the balance.Returns roll up broadly UK tax-free within the fund, and ultimately up to 25% of the pension fund can be taken as a tax-free lump sum with the rest of the fund drawn as taxable payments. Contributions made to a child’s pension do not count against the contributor’s own pension contribution annual allowance and they may also help with the contributor’s inheritance tax (IHT) planning. However, the child will not be able to draw the pension until they reach age 55. This age is set to increase over time, in line with (but ten years below) the rising state pension age. Some friendly societies offer tax-free savings schemes for children which can be specifically designed to mature for a significant event, like an 18th or 21st birthday, starting university or graduation. The maximum investment is £25 a month or £270 a year and bonds must last for at least 10 years for the proceeds to be free of income and CGT. Although the premiums on these schemes are low, the charges can be high. If you are planning to set aside money for the long-term future benefit of a child, you may want to use a trust. A trust is basically a way for one group of people (the trustees− who could include you) to hold investments or other assets for the benefit of some other people – called beneficiaries. Using a trust can also help IHT planning by allowing you to transfer the assets outside your taxable estate. A trust can also control when the children have access to the funds. There are several types of trust with different tax and other legal characteristics. They all have different advantages and drawbacks, but there are two main kinds of trust in this context. Trusts let you, or a group of people, look after investments for children, and can help with estate planning and reducing your inheritance tax bill. The way they are taxed can be complicated so it is worth taking advice before setting one up. These are sometimes called simple or absolute trusts, and are the most commonly used trusts for gifts to children. The beneficiary – in this case the child – is absolutely and immediately entitled to the income and capital held in the trust. The assets are held in the name of the trustees, who manage and make decisions about the trust until the beneficiary reaches the age of 18 (16 in Scotland). At this point, beneficiaries can demand that trustees transfer the trust fund to them. The trustees can decide how much income and/or capital each beneficiary should receive and when. Discretionary trusts are sometimes used to provide for future needs that might not yet have developed, or for beneficiaries who are not capable or responsible enough to deal with money themselves. Bare trusts are generally more tax-efficient than discretionary trusts, but are rather rigid and inflexible. By contrast, discretionary trusts often involve additional tax costs, but provide greater flexibility. An important advantage of discretionary trusts is that you do not have to pass over assets to children when they reach the relatively young age of 18 (16 in Scotland). Trusts can help to ensure your money is used in the ways that you intend for the benefit of children or grandchildren. But they do not necessarily reduce overall tax liabilities, and in some cases a trust might increase the amount of tax to be paid. For example, you could incur IHT on a large lifetime gift into a discretionary trust. The beneficiary of a bare trust is liable for tax on income that the trust receives unless the parental settlement rules apply, although the trustees can pay this tax on their behalf. Beneficiaries should notify their tax office of the income and fill in the appropriate self-assessment tax return form. The rate of tax on the income from investments held in a discretionary trust depends on the type of income and whether it falls within the ‘standard rate band’ – up to the first £1,000 of income. The tax band’s size varies according to whether the settlor – the person who has set up the trust – has established any other trusts. Where the settlor has set up other trusts, the £1,000 band will be split equally between them, subject to a minimum band of £200. So, if the settlor has set up five or more trusts, each trust will benefit from £200 of income taxed at the standard rate. You apply the standard rate band first to non-dividend income and then to dividend income. The dividend allowance is not available to trusts, but dividends falling within the standard rate band are taxable at 7.5%. Income paid by a discretionary trust to a beneficiary is treated as having already been taxed at 45% − the current rate for trusts. If the beneficiaries themselves pay tax at a lower rate, they should be able to reclaim some of this. A beneficiary who does not pay tax, or who pays tax at 20% or 40%, may be able to claim some or all of the tax back. If they pay tax at the 45% rate, there will be no more tax to pay on the trust income. If you set up a trust you may have to pay CGT when you set it up. This could be because you either sell some investments to put cash into the trust or because you simply transfer some of your own existing assets into it. However, if you use a discretionary trust you could postpone the CGT liability by claiming hold-over relief; the person who receives the asset would then pay tax on the held-over gain when in turn they sell or transfer the asset. Trustees are potentially subject to CGT on investments if they realise profits by selling them or transferring them to the beneficiaries. The position varies, mainly depending on the type of trust involved. In the case of a bare trust, the investments are taxed as if the beneficiary owns If the trustees realise gains on any investments, these are taxed on the beneficiary and set against their annual exempt amount. If the gains are large enough to be taxable, the tax rate(s) will generally be 10% and/or 20%, depending on the beneficiary’s own level of income and gains. Residential property gains attract an 8% surcharge. Gains within discretionary trusts are not taxed by reference to the beneficiaries. The trustees have an annual exempt amount of up to £5,850 (£6,000 in 2019/20), although it will be less if the settlor has set up any other trusts (the minimum is £1,170 in 2018/19 and £1,200 in 2019/20). Any net gains that exceed the available allowance are taxed at a flat rate of 20% (or 28% for residential property). A CGT liability may also arise when assets are distributed from the trust. In this situation, the trustees would normally be liable to pay the tax. The main exception to this is in the case of a bare trust, when the beneficiary is ‘absolutely entitled’ to the trust assets, usually because they have reached age 18, or the trust has come to an end. A CGT liability would also arise for the trustees if the trust became non-resident. There is a possibility of incurring an IHT charge on transfers into a trust. If you make an outright gift to an individual, or place it into a bare trust, there could be an IHT charge of up to 40%, but only if you were to die within seven years of making the transfer. 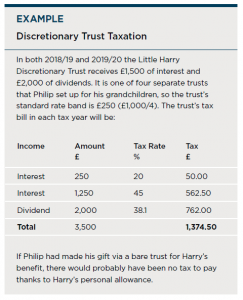 If you make a transfer into a discretionary trust of more than the amount of your unused nil rate band (until at least April 2021 the full band is £325,000), you will have to pay an IHT charge of up to 20% on the excess. If you die within five years of making the gift, there could be a further tax charge to bring the total up to a maximum of 40%. This is less than the usual seven-year period, because the taper relief will eliminate any additional tax after just five years. There could also be further relatively small IHT charges for the trust every ten years that the trust continues and then when assets leave the trust. Trusts and trust investments are not an area for do-it-yourself tax and financial planning. The position is complicated, and the law and HMRC practice change frequently. For example, in November 2018 HMRC launched yet another consultation on the taxation of trusts which could lead to changes being announced in the 2019 Budget. The Financial Conduct Authority does not regulate tax and trust advice, will writing, National Savings and Investments and some forms of estate planning. Different types of trust are taxed in different ways, so it is important to take advice and understand the tax implications before making any decisions. This publication is for general information only and is not intended to be advice to any specific person. You are recommended to seek competent professional advice before taking or refraining from taking any action on the basis of the contents of this publication. The Financial Conduct Authority does not regulate tax advice, so it is outside the investment protection rules of the Financial Services and Markets Act and the Financial Services Compensation Scheme. This publication represents our understanding of law and HM Revenue & Customs practice as at 12 November 2018 and the proposals in the Autumn 2018 Budget.